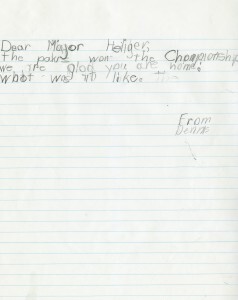 “I am very happy about hering [sic] that you are back from the war, and others. 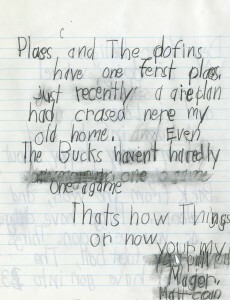 Things have changed as you were gone. 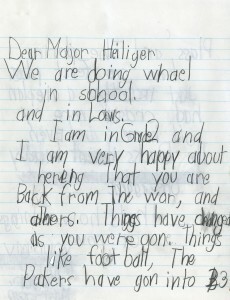 Things like football”. 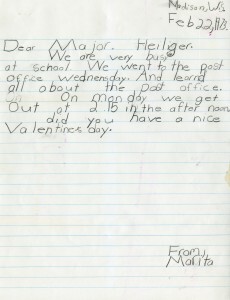 Matt Cain, 2nd grade, Elvehjem Elementary, February 22, 1973. 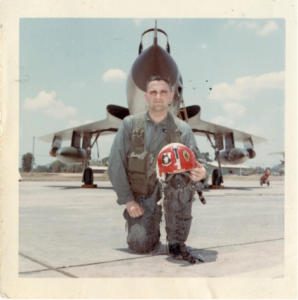 On May 15, 1967, Madison native Major Donald L. Heiliger was hit by anti-aircraft fire during a dangerous night mission and was forced to eject over North Vietnam. 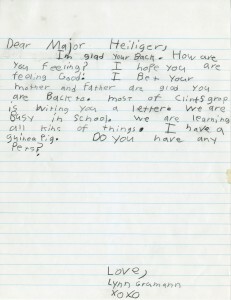 Major Heiliger was taken prisoner and sent to the infamous “Hanoi Hilton,” where he was imprisoned and tortured over the course of six-years. 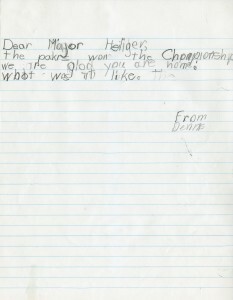 Upon learning of his release on February 18, 1973, Nancy Piper’s 2nd grade class at Elvehjem Elementary School in Madison, wrote personal letters to Major Heiliger welcoming him home. 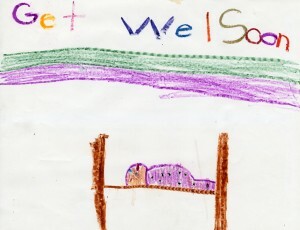 While many Vietnam Soldiers returned home to a less than enthusiastic reception, these letters, written 42-years ago, demonstrate the sensitivity and compassion of young children. 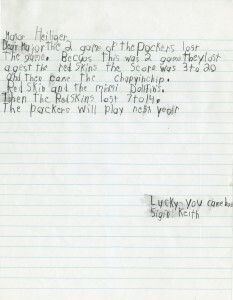 Several of the letters bring Heiliger up-to-date on the Green Bay Packers and Milwaukee Bucks. 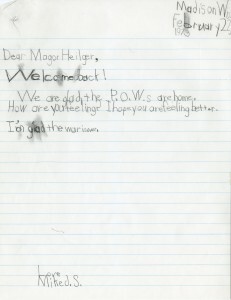 One student writes, “Lucky you came back,” and another, “I hope you are feeling better.” As we reflect on this day of remembrance for the service and sacrifice of our Vietnam Veterans, let us remember all the men and women that have served our country and those that are currently serving today. In 2007, both the U.S. Congress and the U.S. Senate passed resolutions proclaiming March 30th as National Welcome Home Vietnam Veterans Day. 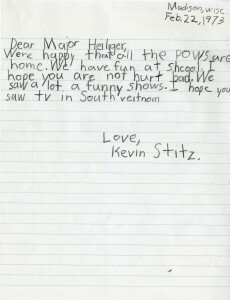 On July 20, 2009, the State of Wisconsin signed into law Act 36 which declared March 29th, Vietnam Veterans Day. In 2007, both the U.S. Congress and the U.S. Senate passed resolutions proclaiming March 30th as National Welcome Home Vietnam Veterans Day. On July 20, 2009, the State of Wisconsin signed into law Act 36 which declared March 29th, Vietnam Veterans Day.